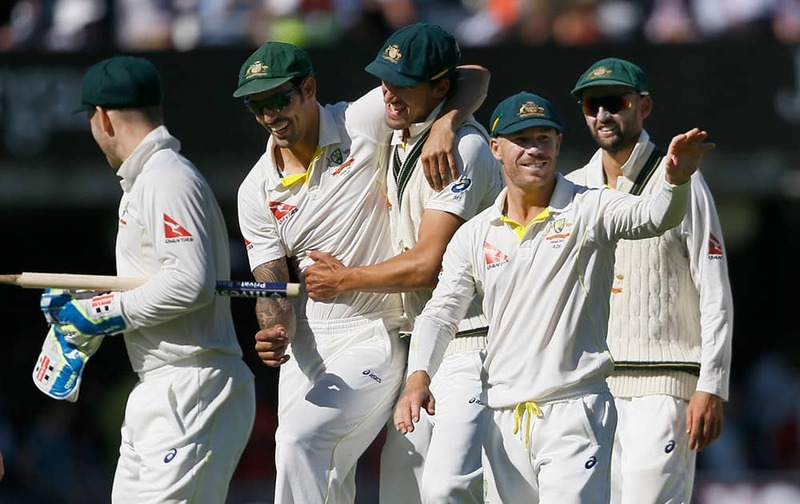 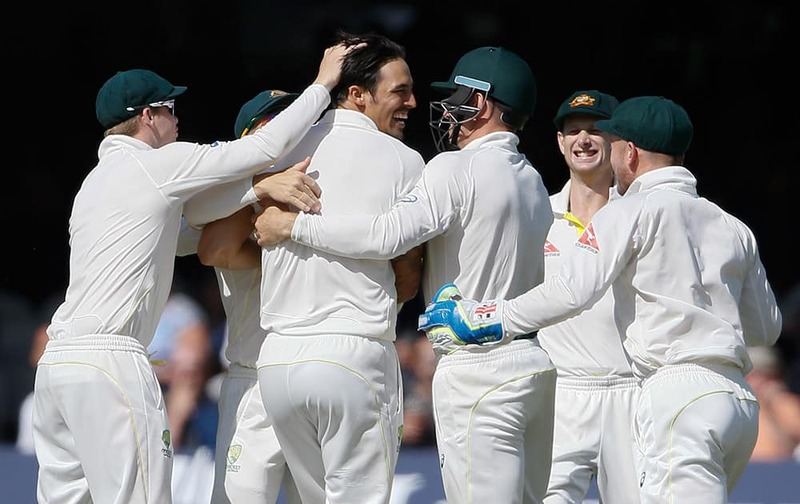 Australia's players celebrate winning the match by 405 run on the fourth day of the second Ashes Test match between England and Australia, at Lord's cricket ground in London. 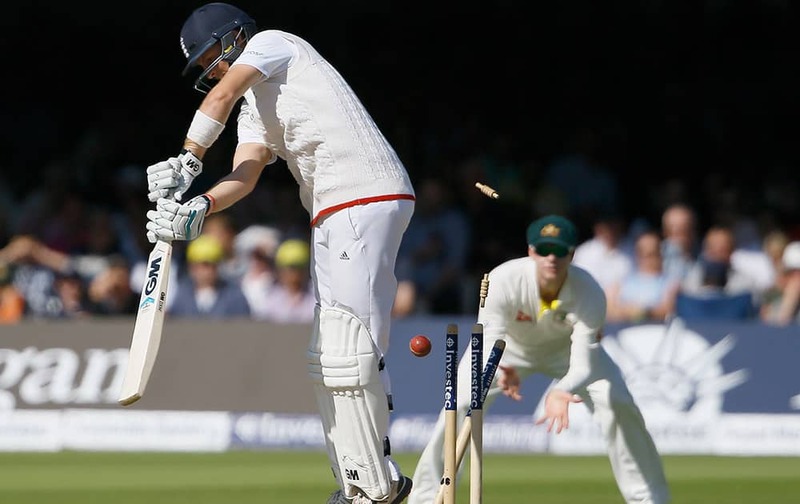 England's James Anderson is bowled by Australia's Josh Hazlewood on the fourth day of the second Ashes Test match between England and Australia, at Lord's cricket ground in London. 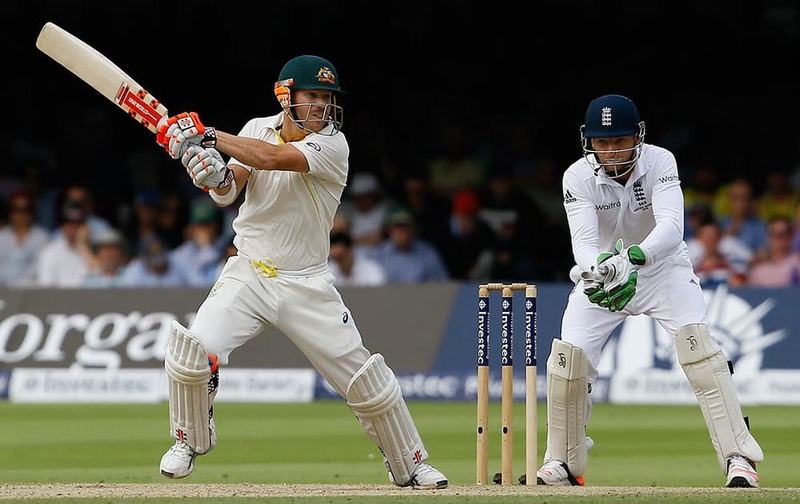 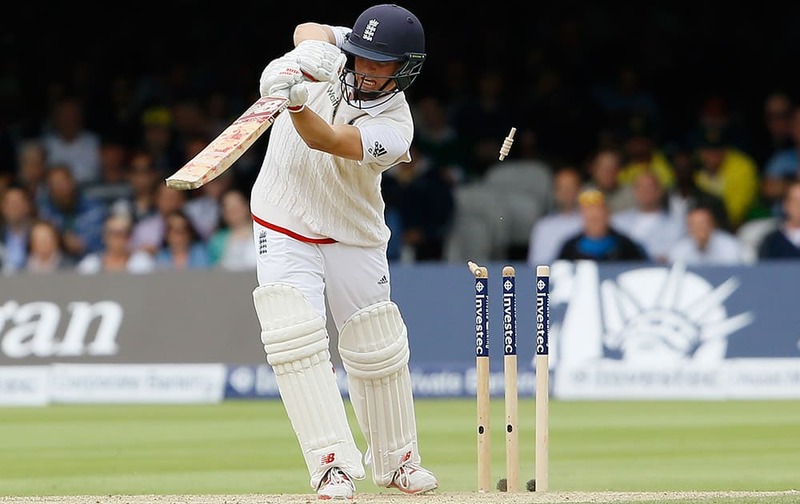 England's Joe Root is bowled by Australia's Josh Hazlewood on the fourth day of the second Ashes Test match between England and Australia, at Lord's cricket ground in London. 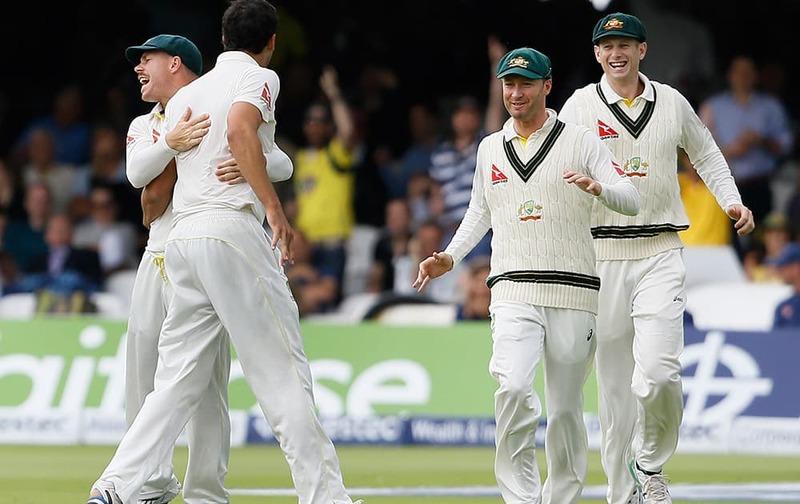 Australia's players celebrate taking the wicket of England's Jos Buttler on the fourth day of the second Ashes Test match between England and Australia, at Lord's cricket ground in London. 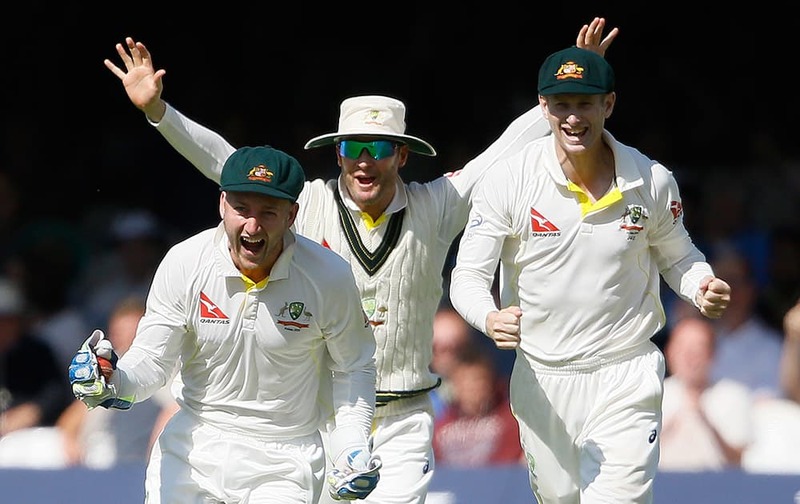 Australia's Peter Nevill, Michael Clarke and Adam Voges celebrate taking the wicket of wicketkeeper Jos Buttler on the fourth day of the second Ashes Test match between England and Australia, at Lord's cricket ground in London. 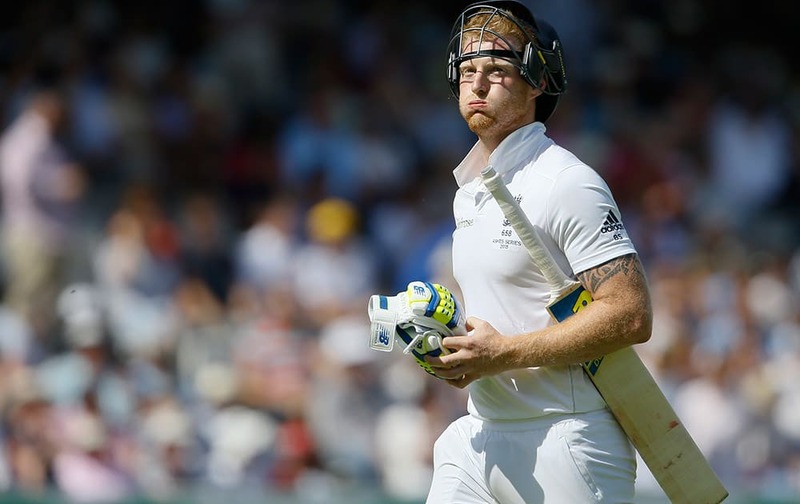 England's Ben Stokes leaves the pitch after being run out on the fourth day of the second Ashes Test match between England and Australia, at Lord's cricket ground in London. 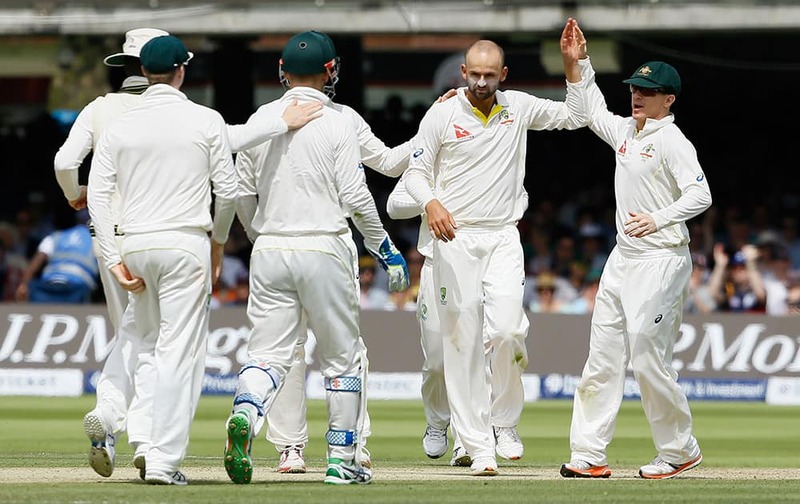 Australia's Nathan Lyon celebrates taking the wicket of England's Ian Bell on the fourth day of the second Ashes Test match between England and Australia, at Lord's cricket ground in London. 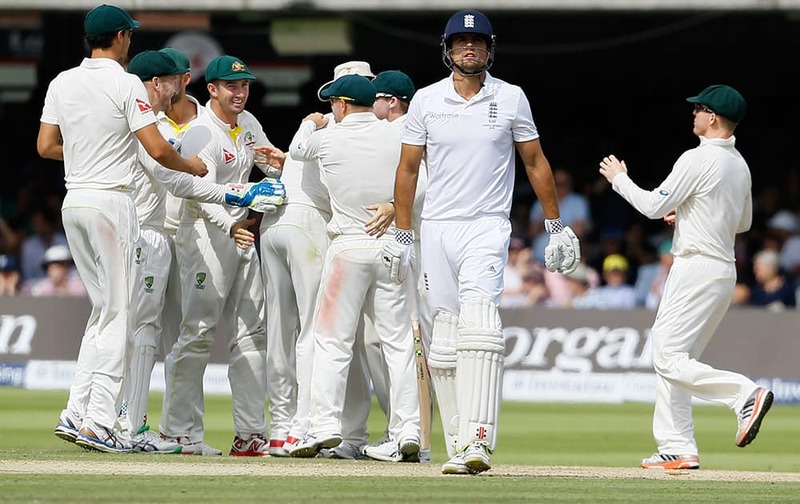 Australia's Mitchell Johnson is congratulated on taking the wicket of England's Alastair Cook on the fourth day of the second Ashes Test match between England and Australia, at Lord's cricket ground in London. 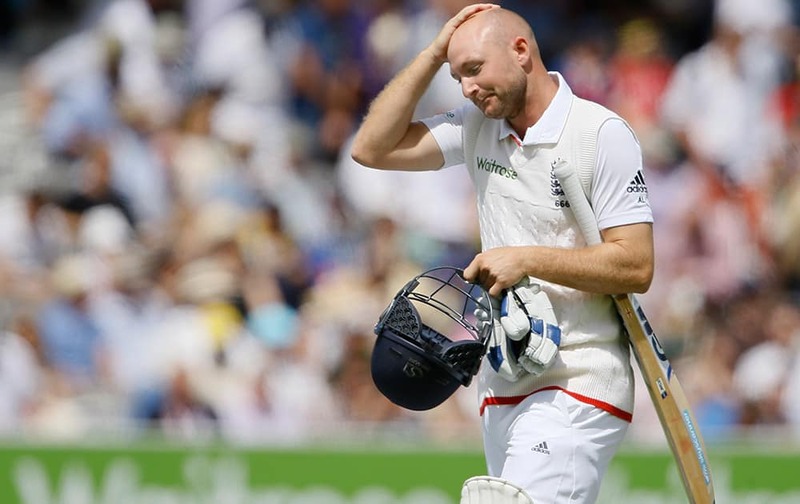 England's Adam Lyth leaves the pitch after being caught by Peter Nevill off the bowling of Australia's Mitchell Starc on the fourth day of the second Ashes Test match between England and Australia, at Lord's cricket ground in London. 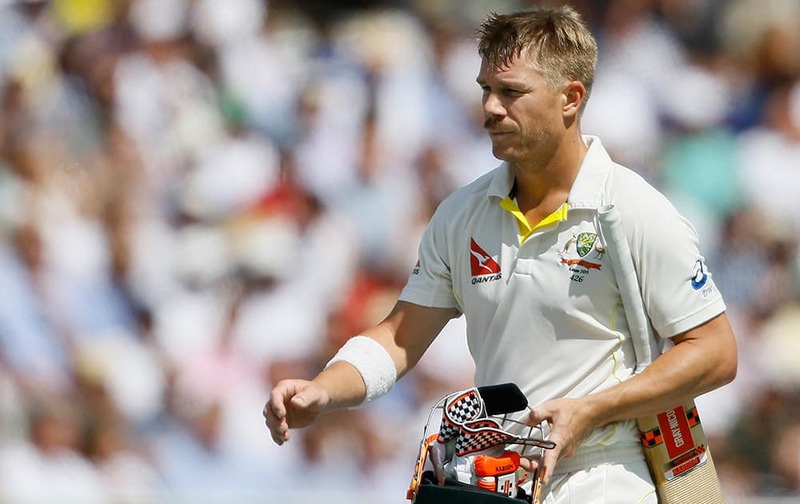 Australia's David Warner leaves the pitch after being caught by Alastair Cook off the bowling of England's Moeen Ali on the fourth day of the second Ashes Test match between England and Australia, at Lord's cricket ground in London. 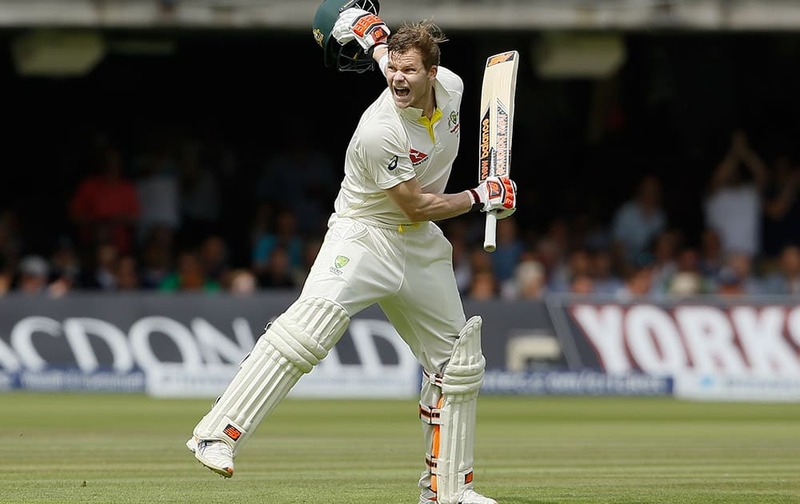 Australia's Steven Smith plays a shot off the bowling of England's Moeen Ali on the fourth day of the second Ashes Test match between England and Australia, at Lord's cricket ground in London. 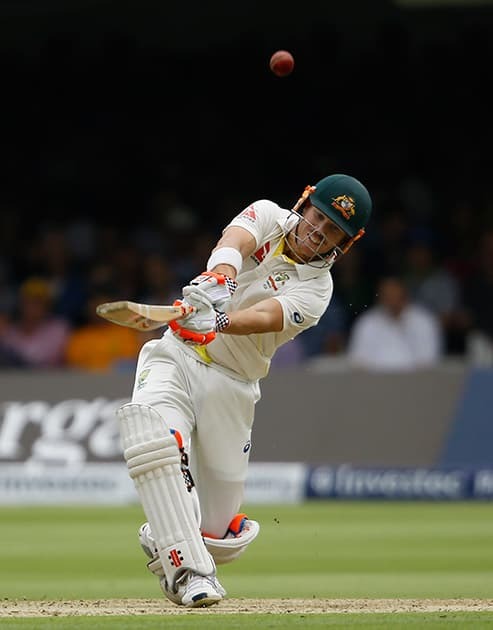 Australia's David Warner plays a shot off the bowling of England's Moeen Ali on the fourth day of the second Ashes Test match between England and Australia, at Lord's cricket ground in London. 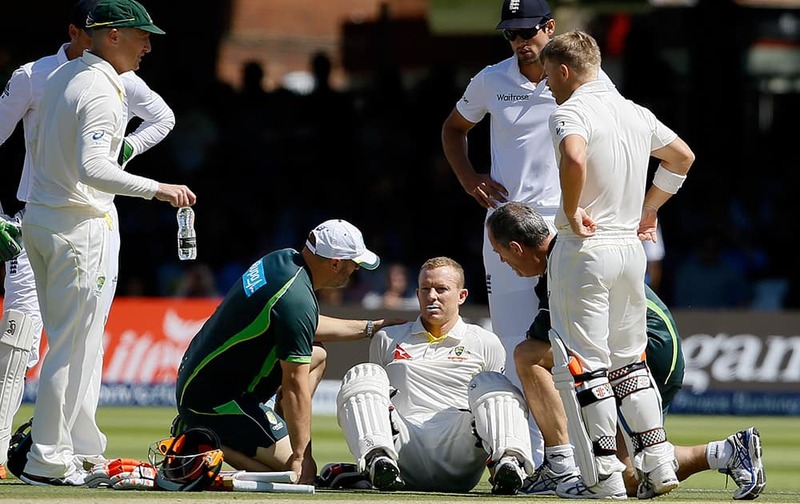 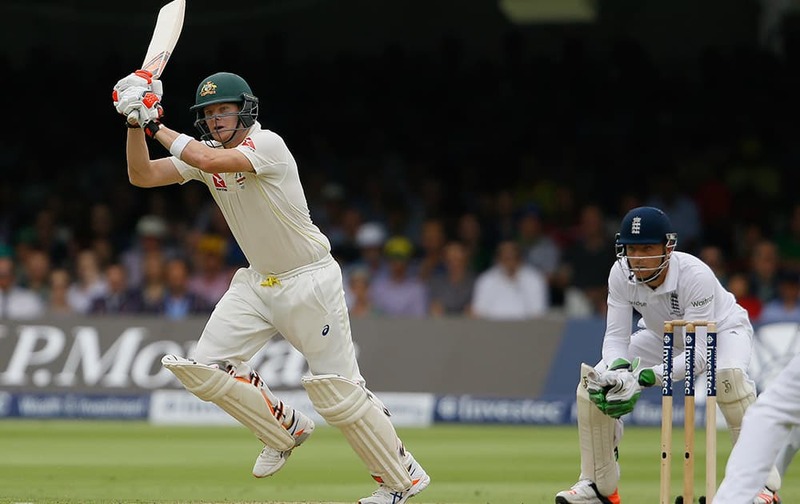 Australia's batsman Chris Rogers sits on the ground as he gets ill, and retires not out on the fourth day of the second Ashes Test match between England and Australia, at Lord's cricket ground in London. 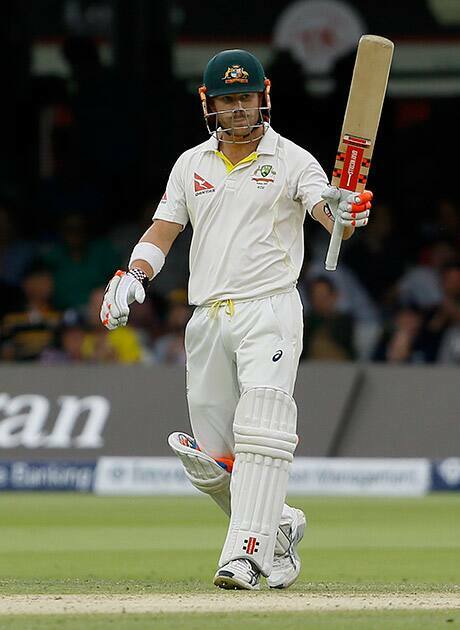 Australia's David Warner celebrates his half century on the third day of the second Ashes Test match between England and Australia, at Lord's cricket ground in London. 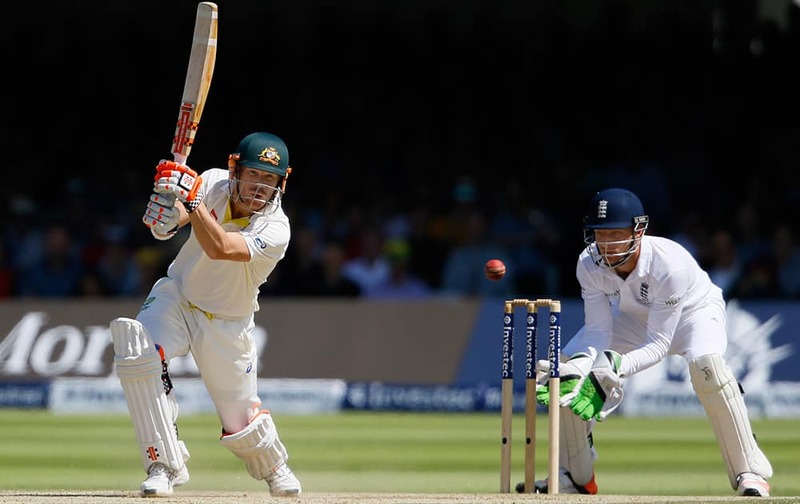 Australia's David Warner plays a shot off the bowling of England's Moeen Ali on the third day of the second Ashes Test match between England and Australia, at Lord's cricket ground in London. 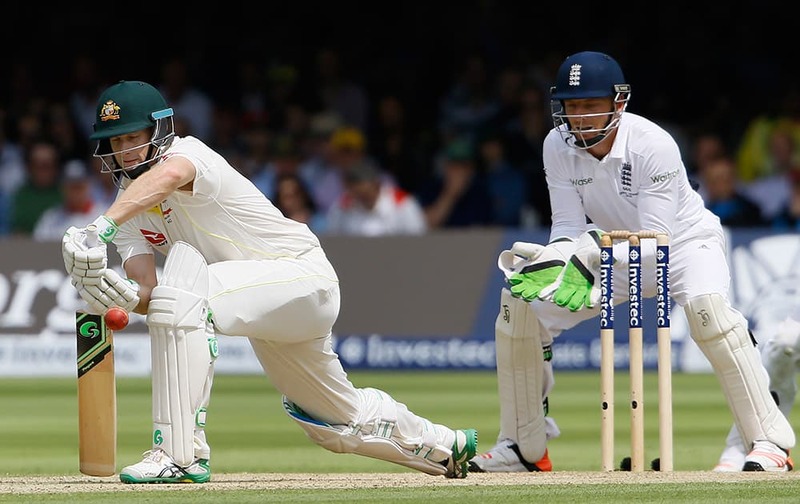 Australia's Chris Rogers plays a shot off the bowling of England's Moeen Ali on the third day of the second Ashes Test match between England and Australia, at Lord's cricket ground in London. 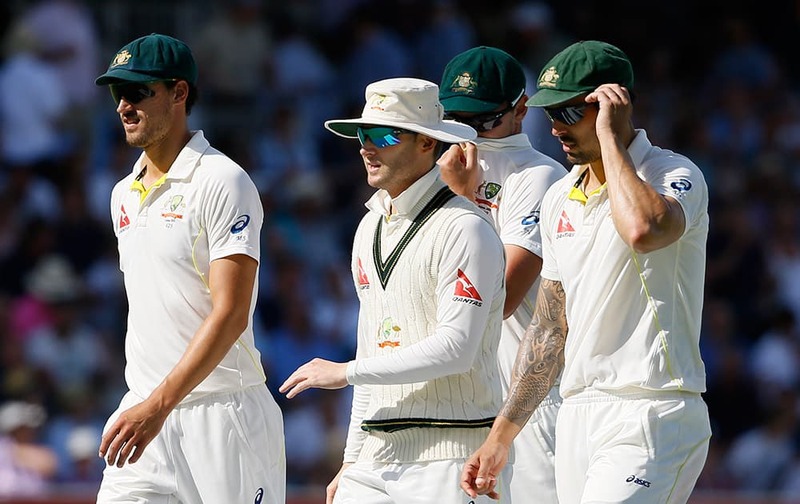 Australia's captain Michael Clarke leaves the pitch with his players after bowling out England for 312 on the third day of the second Ashes Test match between England and Australia, at Lord's cricket ground in London. 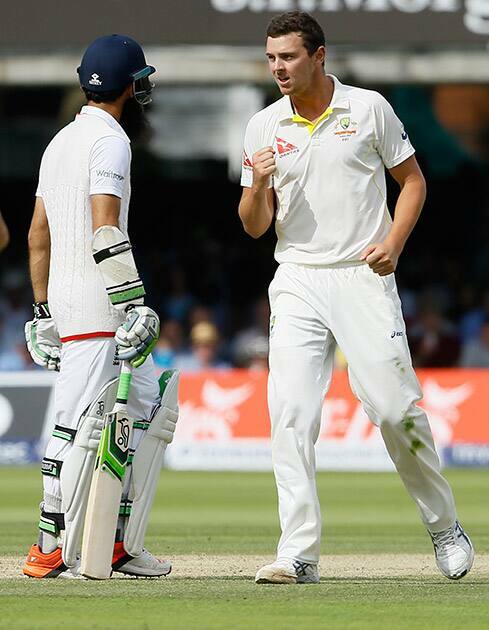 Australia's Josh Hazlewood celebrates taking the wicket of England's Moeen Ali on the third day of the second Ashes Test match between England and Australia, at Lord's cricket ground in London. 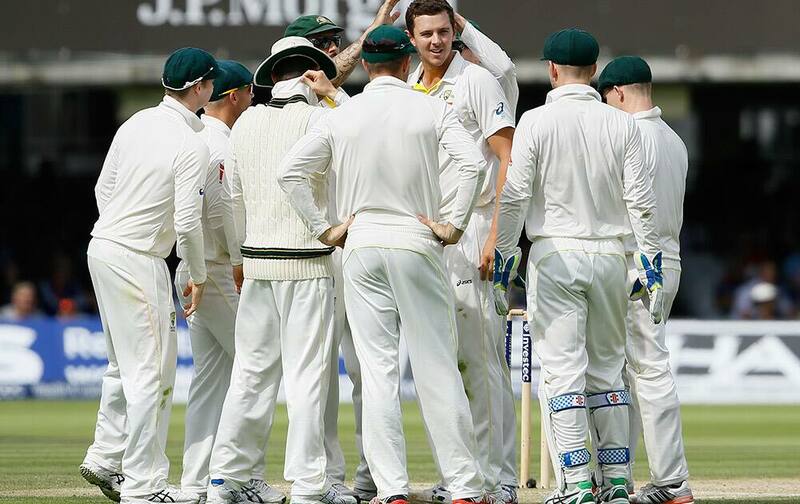 Australia's players celebrate as England's Alastair Cook leaves the pitch after he is bowled by Australia's Mitchell Marsh on the third day of the second Ashes Test match between England and Australia, at Lord's cricket ground in London. 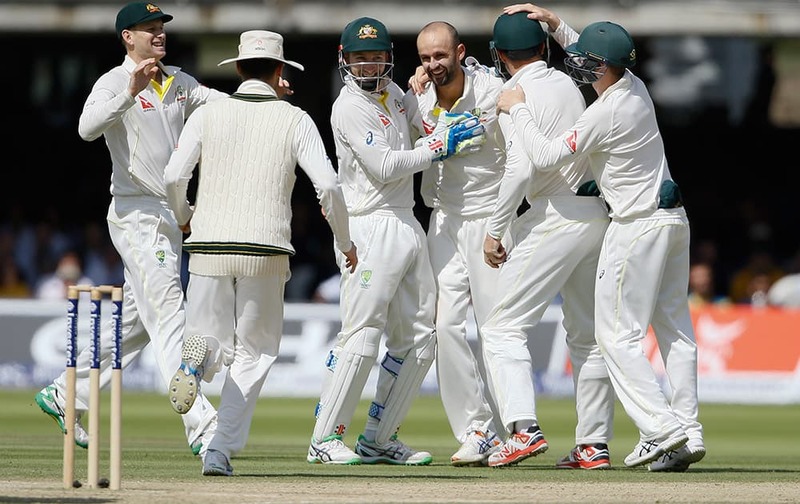 Australia's Nathan Lyon celebrates taking the wicket of England's Jos Buttler on the third day of the second Ashes Test match between England and Australia, at Lord's cricket ground in London. 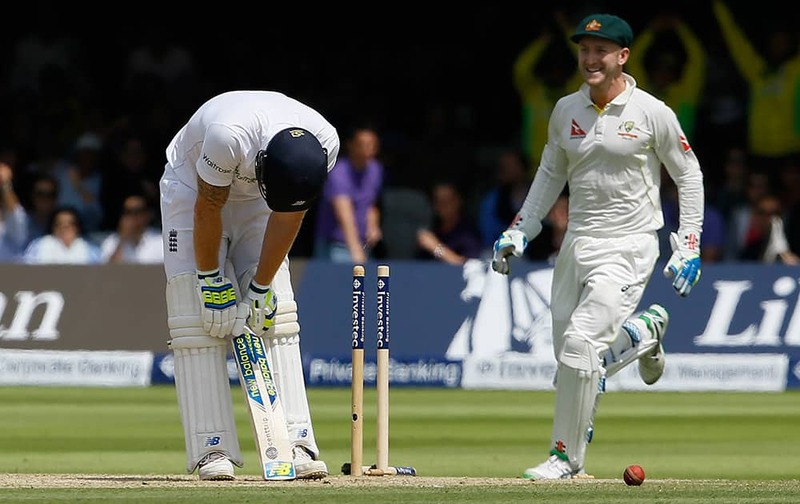 England's Ben Stokes hangs his head after he is bowled by Australia's Mitchell Marsh on the third day of the second Ashes Test match between England and Australia, at Lord's cricket ground in London. 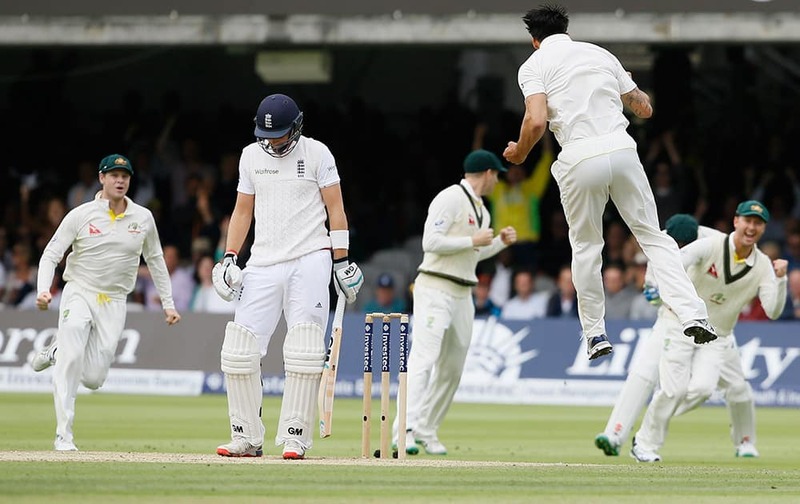 England's Joe Root looks down as Australia's Mitchell Johnson jumps to celebrate taking his wicket on the second day of the second Ashes Test match between England and Australia, at Lord's cricket ground in London. 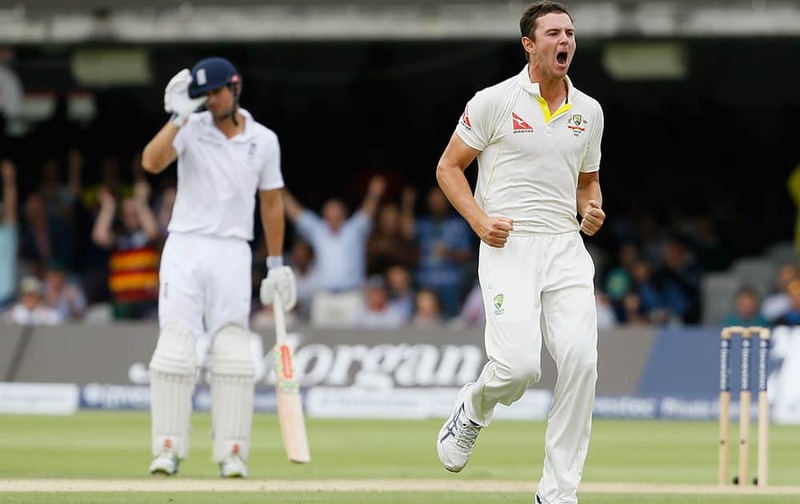 Australia's Josh Hazlewood runs past Alastair Cook to celebrate taking the wicket of England's Ian Bell on the second day of the second Ashes Test match between England and Australia, at Lord's cricket ground in London. 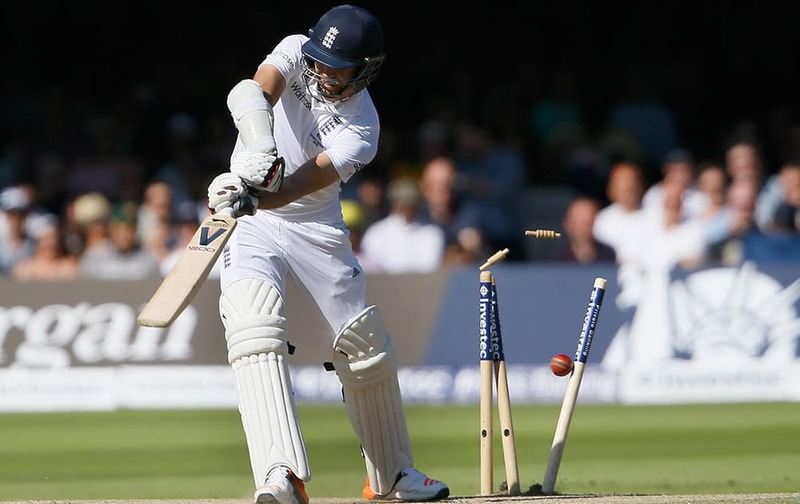 England's Gary Balance is bowled by Australia's Mitchell Johnson on the second day of the second Ashes Test match between England and Australia, at Lord's cricket ground in London. 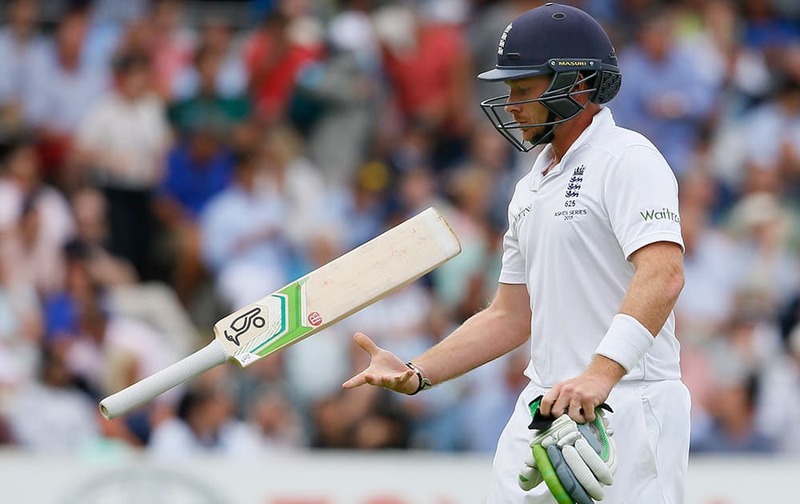 England's Ian Bell throws his bat as he leaves the pitch after being bowled by Australia's Josh Hazlewood on the second day of the second Ashes Test match between England and Australia, at Lord's cricket ground in London. 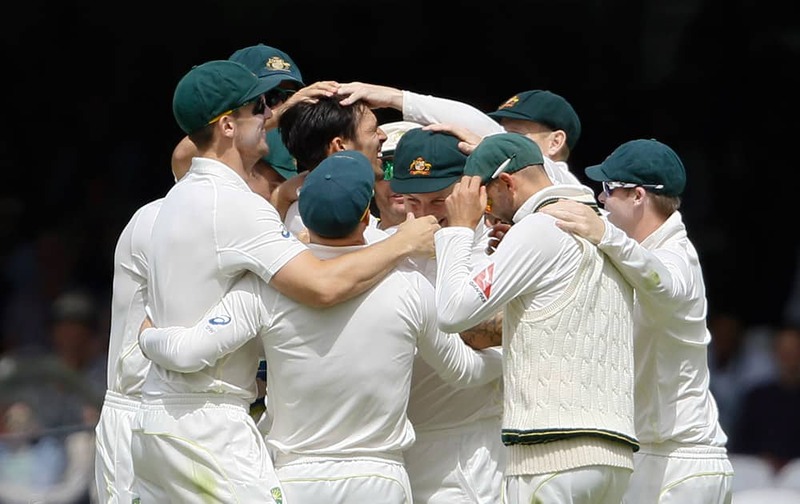 Australia's players celebrate taking the wicket of England's Adam Lyth on the second day of the second Ashes Test match between England and Australia, at Lord's cricket ground in London. 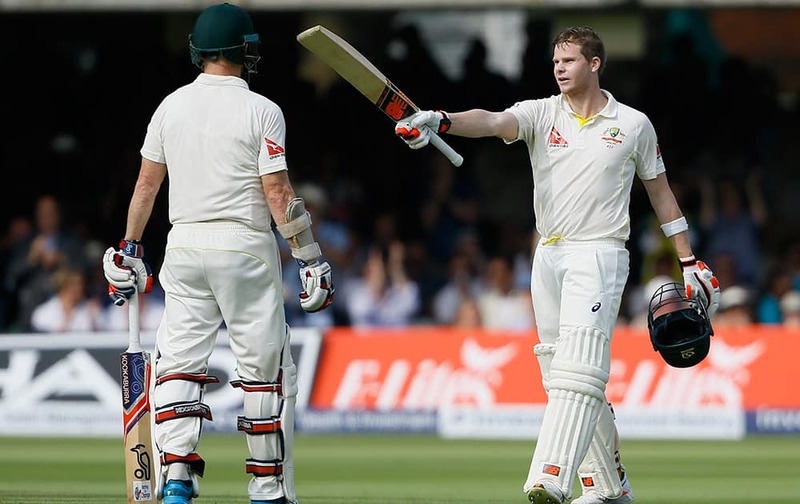 Australia's Steven Smith celebrates getting 200 runs on the second day of the second Ashes Test match between England and Australia, at Lord's cricket ground in London. 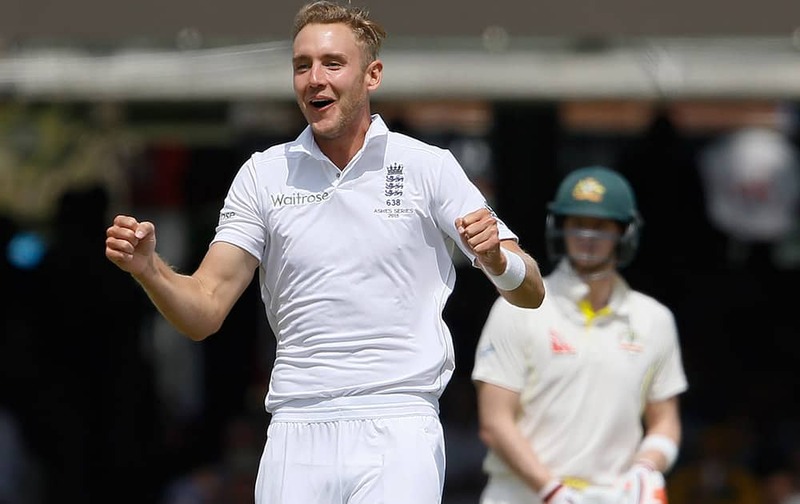 England's Stuart Broad celebrates taking the wicket of Australia's Adam Voges on the second day of the second Ashes Test match between England and Australia, at Lord's cricket ground in London. 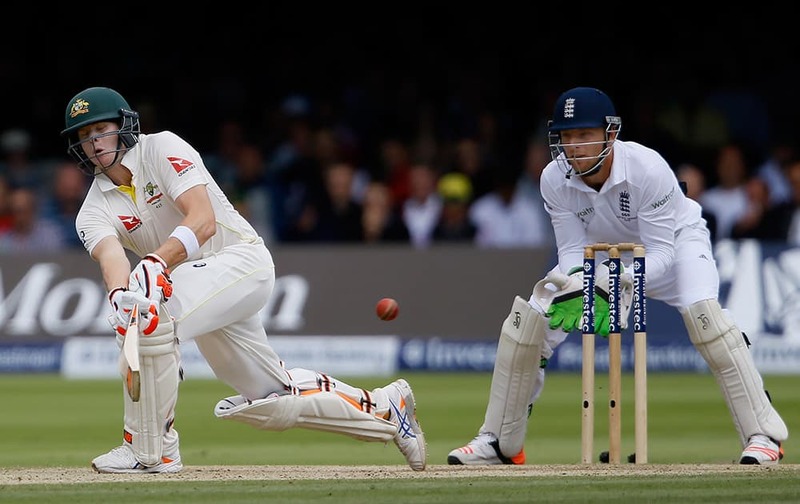 Australia's Adam Voges plays a shot off the bowling of England's Moeen Ali on the second day of the second Ashes Test match between England and Australia, at Lord's cricket ground in London. 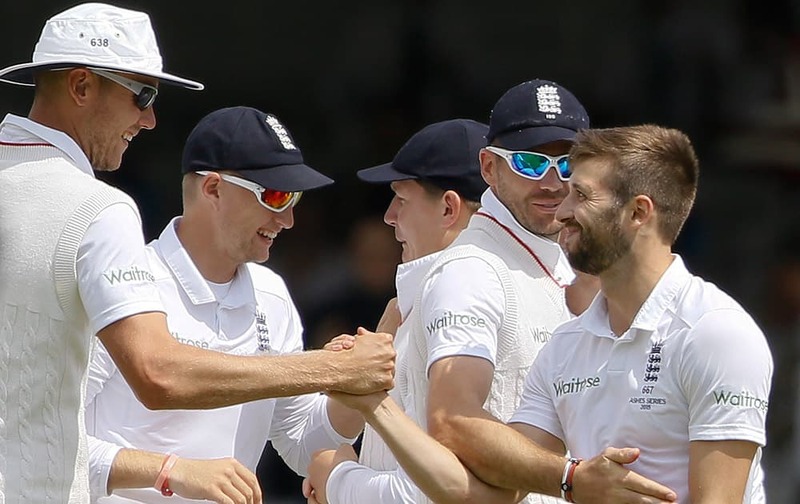 England's Mark Wood celebrates taking the wicket of Australia's Michael Clarke on the second day of the second Ashes Test match between England and Australia, at Lord's cricket ground in London. 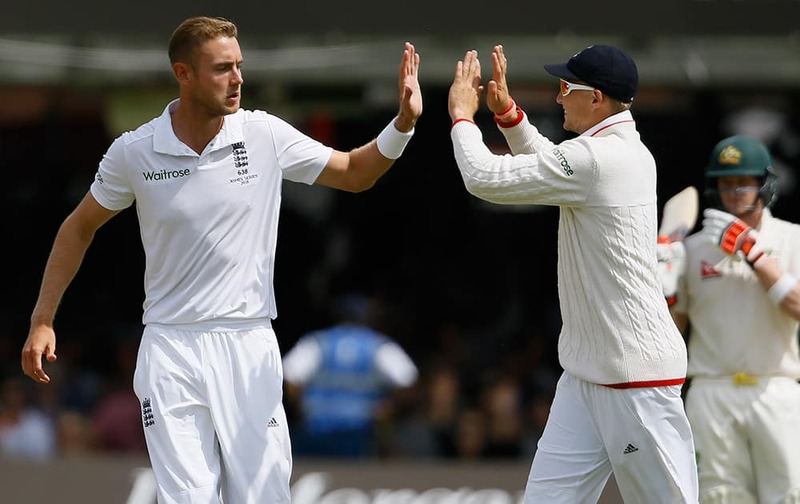 England's Stuart Broad and Joe Root celebrate taking the wicket of Australia's Chris Rogers on the second day of the second Ashes Test match between England and Australia, at Lord's cricket ground in London. 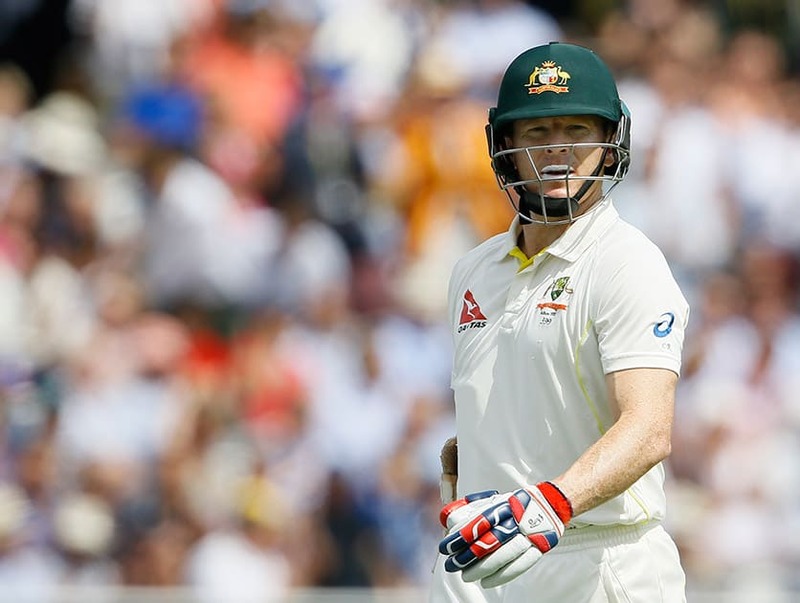 Australia's Chris Rogers leaves the pitch after being bowled by England's Stuart Broad on the second day of the second Ashes Test match between England and Australia, at Lord's cricket ground in London. 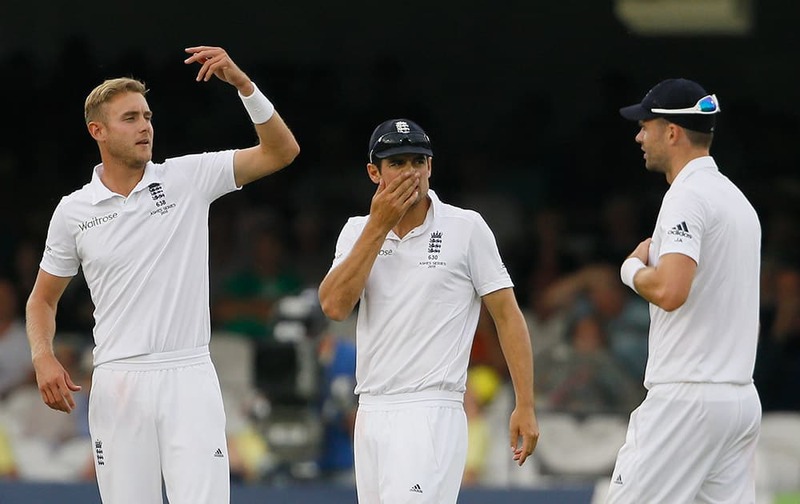 England's captain Alastair Cook with Stuart Broad and James Anderson as Australia ad runs on the first day of the second Ashes Test match between England and Australia, at Lord's cricket ground in London. 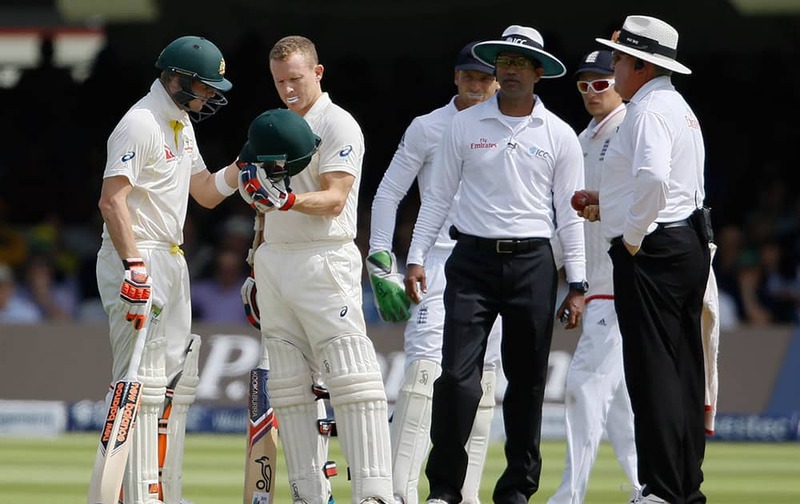 Australia's Chris Rogers, inspects his helmet with Steven Smith, left, after he was hit on the head by the first ball on the second day of the second Ashes Test match between England and Australia, at Lord's cricket ground in London. 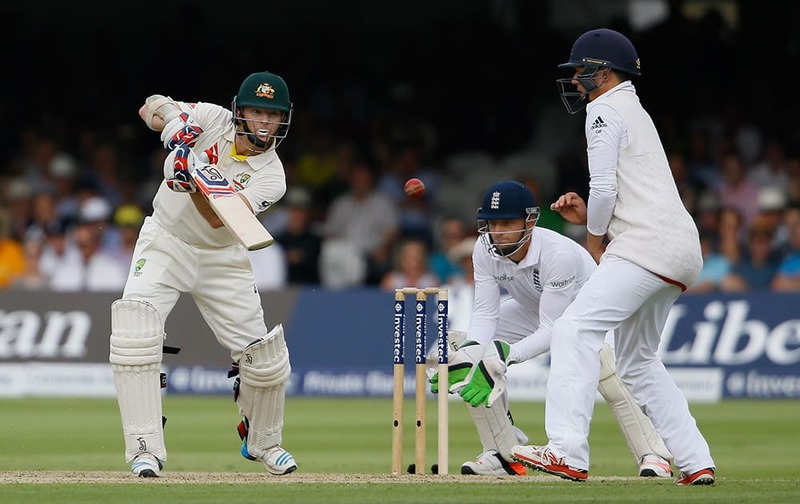 Australia's Steven Smith plays a shot off the bowling of England's Moeen Ali on the first day of the second Ashes Test match between England and Australia, at Lord's cricket ground in London. 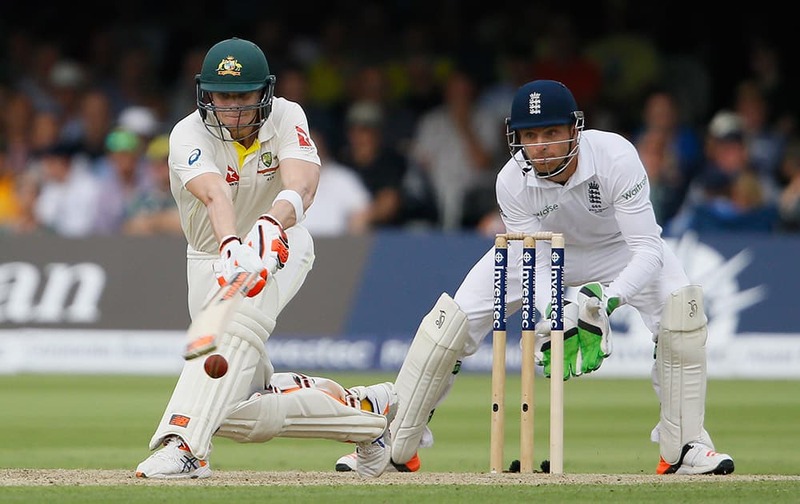 Australia's Chris Rogers plays a shot off the bowling of England's Joe Root on the first day of the second Ashes Test match between England and Australia, at Lord's cricket ground in London. 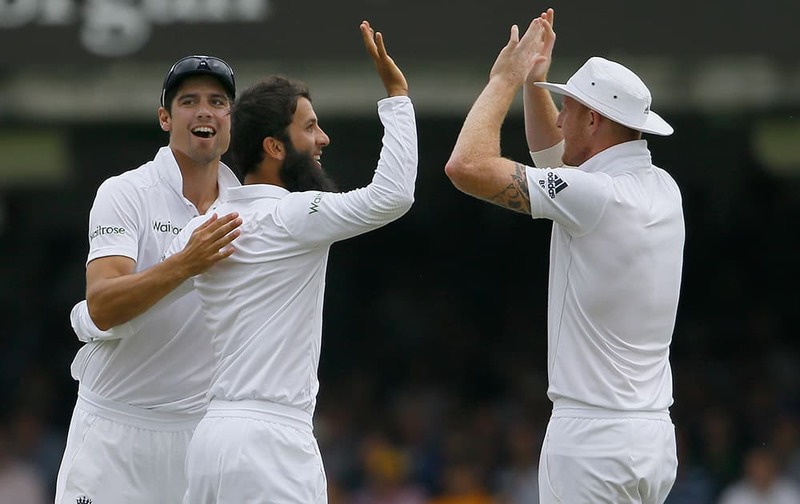 England's Moeen Ali celebrates with Alastair Cook and Ben Stokes after taking the wicket of Australia's David Warner on the first day of the second Ashes Test match between England and Australia, at Lord's cricket ground in London. 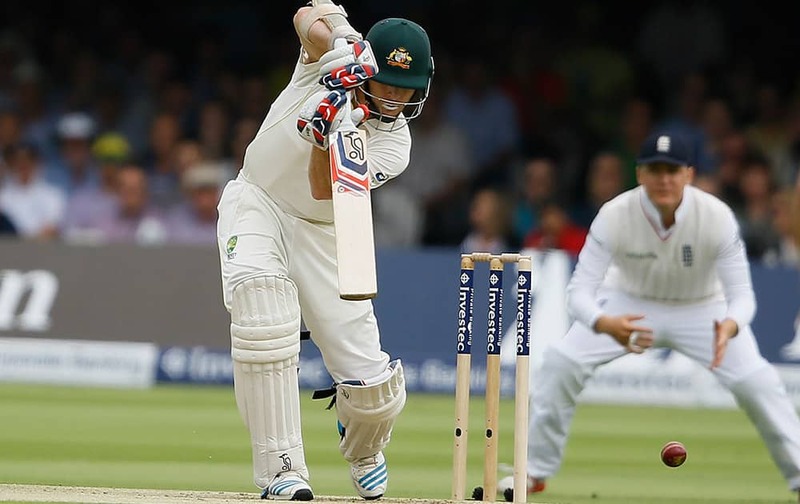 Australia's David Warner plays a shot off the bowling of England's Moeen Ali, which was caught by James Anderson on the first day of the second Ashes Test match between England and Australia, at Lord's cricket ground in London. 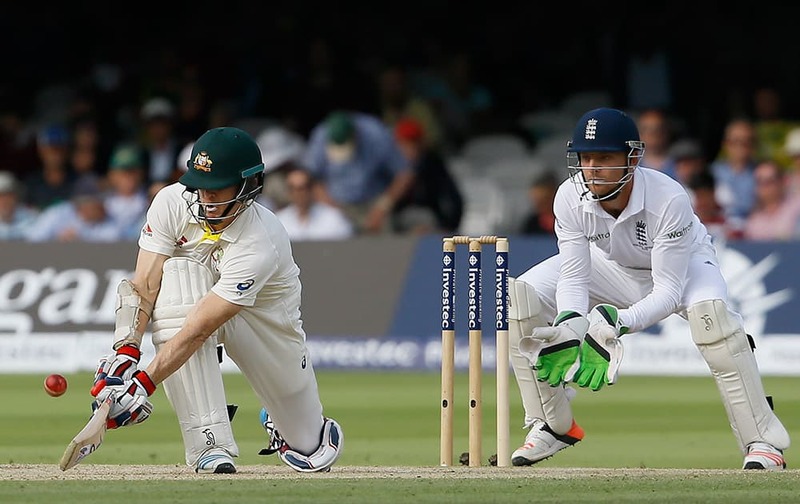 Australia's Chris Rogers plays a shot off the bowling of England's James Anderson on the first day of the second Ashes Test match between England and Australia, at Lord's cricket ground in London. 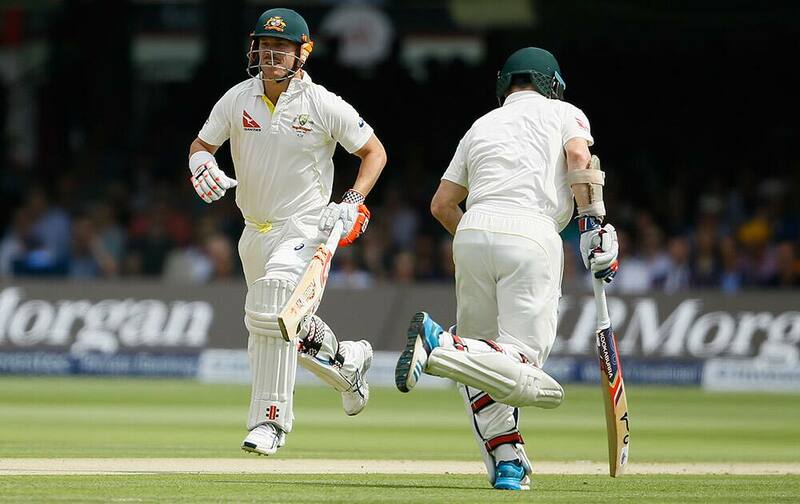 Australia's David Warner and Chris Rogers add runs on the first day of the second Ashes Test match between England and Australia, at Lord's cricket ground in London. 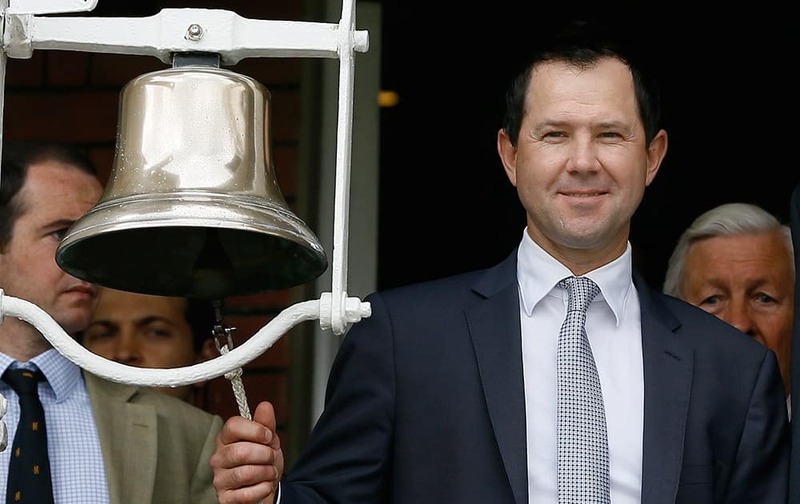 Former Australian cricket team captain Ricky Ponting rings the bell to signify five minutes to the start of play on the first day of the second Ashes Test match between England and Australia, at Lord's cricket ground in London.